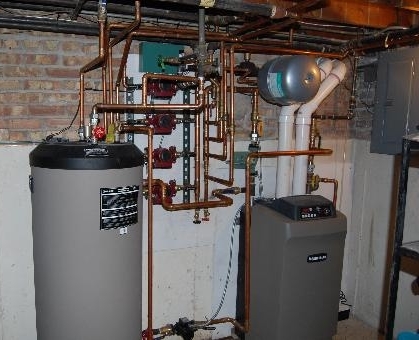 Multiple unit apartment or condominium buildings, commercial, retail, office or industrial buildings with steam or hot water heating systems need the right control system for maximum fuel savings while maintaining optimum comfort throughout. We can check and fine tune your existing system or recommend and install a new technologically advanced system that fits your building needs and budget perfectly. Outdoor reset controls with night set back for added fuel savings, or space sensing with multiple averaging temperature sensors, or a combination of both for the ultimate in boiler controls are now available. Remote communications and monitoring from any PC are also among many optional features we can include in a system designed to fit your needs. 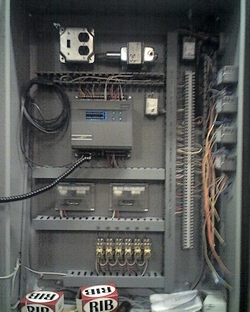 A recent custom control panel installation for a 20,000 sq. ft. office building retrofit using Johnson Controls. The control system operates a 4 stage DX air conditioning condenser; 2 remote boilers, mixing valves and pumps located approximately 200 ft. away in adjoining building; economizer and exhaust dampers; and interfaced with existing Yaskawa frequency drives for supply and return blowers. 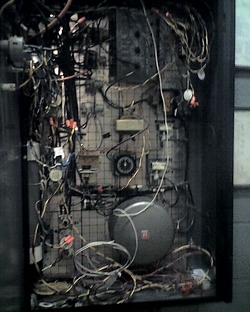 The left picture shows the old panel with pneumatic devices. Right picture shows new panel with digital controller and 2 pneumatic transducers to operate existing pneumatic dampers that were still functional. We pride ourselves in supplying and custom installing some of the finest state of the art equipment available today with annual fuel efficiencies of up to 98%. Whether you have forced air, hot water, or a steam heating system, we can upgrade or replace your furnace or boiler and save you big bucks on your home heating bill. If you have a hot water heating system, the new Ultra Boiler by Weil-McLain is the highest efficient American made gas fired boiler available today, and can also provide you with all the domestic hot water you could ever need for a fraction of the fuel cost you're paying now with your standard current water heater. Steam boilers available up to 82% AFUE. Forced air furnaces have come a long way since the early models available at the end of the last century. At the top of this furnace line-up is the Rheem Classic 90 Plus Modulating Gas Furnace with Contour Comfort Control- North America's first truly modulating gas furnace. Not only does the Rheem Classic 90 Plus with Contour Comfort Control feature a 94 percent or greater Annual Fuel Utilization Efficiency rating, it also provides significant savings on both gas and electricity, while providing superior comfort and reducing the number of hot and cold spots in your home.